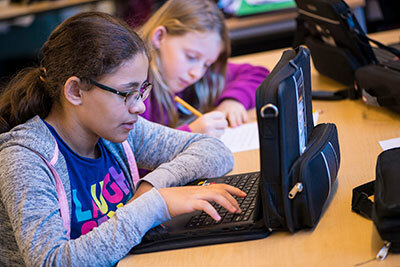 Fifth grade students write in a variety of genres, and literature selections complement the social studies curriculum. Students read novels set in the Middle Ages, such as The King’s Shadow, The Boy and the Samurai, and The Legend of the Wandering King. The language arts program seeks to foster a love of reading and writing while also developing a solid foundation in reading comprehension, literary elements, grammar, and vocabulary. The literature selections for 6th grade language arts emphasize fiction that is appealing to adolescents. Sixth grade favorites include Free?, Inside Out and Back Again, and March. Students also read and write essays, short stories, plays, and poetry. Discussions, group activities, and projects push students to develop a deeper understanding of the material they are reading. Language arts instruction incorporates practice in spelling, reading comprehension, and vocabulary. Formal grammar study continues with a focus on proper sentence construction, correct word use, and parts of speech. Students write regularly in a variety of ways: journaling, poetry, short stories, personal expressive writing, book reviews, and commentaries. The English/language arts program in 7th and 8th grades concentrates on developing the skills of close textual analysis and written expression. Students are introduced to the genres of the short story, the novel, drama, and poetry. Major texts in 7th grade currently include To Kill a Mockingbird, The Miracle Worker, A Raisin in the Sun, Twelve Angry Men, Inherit the Wind, The Martian Chronicles, and A Midsummer Night’s Dream, as well as shorter works of prose and poetry by Edgar Allan Poe, O. Henry, Langston Hughes, Emily Dickinson, and others. In 8th grade, students currently read The Tempest, Siddhartha, Things Fall Apart, and The Odyssey, among other works of nonfiction, fiction, and poetry. Teachers supply sufficient scaffolding for students to come to terms with these challenging texts. In both years, analytical and creative writing are emphasized. By investing in the process of composition, students learn to plan, draft, evaluate, and revise paragraphs, essays, and imaginative pieces. They develop a grammatical understanding of their writing, and their vocabulary grows with their reading. Students also learn to make interdisciplinary connections with other subject areas in lessons and units.